At the end of the school year, I wanted to give all of the kids in CheezWaster’s preschool class a little treat. I put together these little bags that each contained a mini beach ball (still deflated in package-balls and bags came from Oriental Trading). 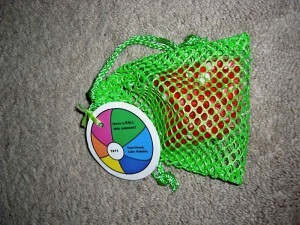 I made a little beach ball tag that read “Have a Ball this Summer!”. I included the year in the white center portion and of course my son’s name. Now, I’ll be honest, making this tag was a project and a half for me. I don’t have Photo Shop and even if I did, I probably wouldn’t know how to make anything like some of the fabulous printables that are out there on the internet. So this is the poor man’s version: I searched in Google Images for Beach Balls and found this PNG. I saved it into Paint (how 80s, I know!) and added the text. The real pain in the neck came when I noticed that the little spaces in the letters had white, rather than the colors of the beach ball. I then had to find that precise, tiny space to click to get the color in. 478 clicks later, I finally got all of the letters colored in. It worked, it looked nice and it was FREE! I used a 2 inch circle punch and attached the tags with curling ribbon. These would work great for a pool party or birthday party (I hope you had a ball at my party!) or a back to school party (Have a ball this year at school!). 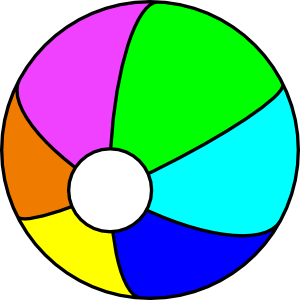 Here is the PNG file I used for the Beach Ball. Save away and go have a ball! Have a Ball! 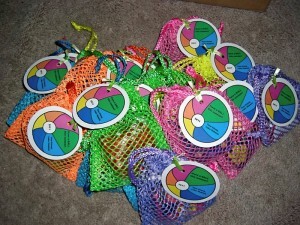 has been posted in Crafty Mamamamahoney, Kiddie Mamamamahoney, Parental Mamamamahoney and Tagged: back to school party favor, bags with mini beach balls, ball party favors, end of school favor, end of school gift, have a ball, have a ball party favor, mini beach ball bags, party favor.